The Trojan War was a war waged, according to legend, against the city of Troy in Asia Minor by the armies of the Achaeans, following the kidnapping (or elopement) of Helen of Sparta by Paris of Troy. the most important events in Greek mythology and was narrated in a cycle of epic poems of which only two, the Iliad and the Odyssey of Homer, survive intact. The Iliad describes an episode late in this war, and the Odyssey describes the journey home of one of the Greek leaders, Odysseus. Other parts of the story, and different versions, were elaborated by later Greek poets, and by the Roman poet Virgil in his Aeneid. Ancient Greeks believed that the events Homer related were basically true. They believed that this war took place in the 13th or 12th century BC, and that Troy was located in the vicinity of the Dardanelles in what is now north-western Turkey. By modern times both the war and the city were widely believed to be mythological. In 1870, however, the German archaeologist Heinrich Schliemann excavated a site in this area which he believed to be the site of Troy, and at least some archaeologists agree. There remains no certain evidence that Homer's Troy ever existed, still less that any of the events of the Trojan War cycle ever took place. Many historians believe that the Homeric stories are a fusion of various stories of sieges and expeditions by the Greeks of the Bronze Age or Mycenean period, and do not describe actual events. Those who think that the stories of the Trojan War derive from a specific historical conflict usually date it to between 1300 BC and 1200 BC. According to Greek mythology, Zeus became king of the gods by overthrowing his father Cronus; Cronus in turn had overthrown his father Ouranos. Zeus came to learn of a prophecy that he himself would be overthrown by a son of his. (Within the extent of Greek myth, though, this never happened). Another prophecy said of the sea-nymph Thetis, with whom Zeus had an affair, that her son would be greater than his father. Possibly for one or both of these reasons, Thetis was betrothed upon Zeus' orders to a now-elderly human king, Peleus. To Peleus and Thetis a son was born, named Achilles. It was prophesied that he would die, young, at Troy. Hoping to protect him, when he was an infant his mother bathed him in the river Styx, making him invincible everywhere except the heel by which she held him. He grew up to be the greatest of all mortal warriors. All of the gods were invited to Peleus and Thetis' wedding, except Eris, or Discord. Insulted, she attended invisibly and cast down upon the table a golden apple on which were inscribed the words Kallisti, (To the fairest one). The apple was claimed by Hera, Athene, and Aphrodite. They quarreled bitterly over it, and none of the other gods would venture an opinion favouring one contender for fear of earning the enmity of the other two. Eventually, Zeus ordered the matter to be settled by the judgment of Paris, a prince of Troy, who was being raised as a shepherd because of a prophecy that he would be the downfall of Troy. The goddesses tried to bribe the boy. Athena offered Paris wisdom, skill in battle, and the abilities of the greatest warriors; Hera offered him political power and control of all of Asia, and Aphrodite offered him the love of the most beautiful woman in the world. Paris awarded the apple to Aphrodite, and returned to Troy. The most beautiful woman in the world was Helen, one of the daughters of Tyndareus, king of Sparta. Her mother was Leda, who had been seduced by Zeus in the form of a swan; accounts differ over which of Leda's four children were fathered by Zeus and which by Tyndareus. Helen had scores of suitors, and her father was unwilling to choose one for fear the others would retaliate violently. Finally, one of the suitors, Odysseus of Ithaca, proposed a plan to solve the dilemma. In exchange for Tyndareus' support of his own suit towards Penelope, he suggested that Tyndareus require all of Helen's suitors to promise that they would defend the marriage of Helen, regardless of who she chose. The suitors duly swore the required oath, although not without a certain amount of grumbling. Helen chose Menelaus to wed. He had humbly not petitioned for her himself, but instead sent his brother Agamemnon on his behalf. The two brothers had been living at Tyndareus' court since being exiled from their homeland of Argos after their father, Atreus, was killed and had his throne usurped by his brother Thyestes and Thyestes' son Aegisthus. Menelaus inherited Tyndareus' throne of Sparta, with Helen as his queen, and Agamemnon married Helen's sister Clytemnestra and took back the throne of Argos. On a diplomatic mission to Sparta, Paris fell in love with Helen and, with Aphrodite's help, kidnapped or seduced her (accounts vary) and took her back to Troy as his wife. All the kings and princes of Greece were called upon to make good their oaths and retrieve Helen. The story of Helen is paralleled by the earlier elopement from Troy of the princess Hesione with Telamon of Salamis. Odysseus had by this time married Penelope and fathered a son, Telemachus. In order to avoid the war, he feigned madness, and sowed his fields with salt. Palamedes outwitted him by putting his infant son in front of the plough, and Odysseus turned aside, unwilling to kill his son, and so revealed his sanity and joined the war. Calchas the oracle had stated that the Greeks would not win without Achilles. His mother Thetis, knowing that Achilles would die if he went to Troy, disguised him as a woman in the court of king Lycomedes in Scyros. There he had an affair with the king's daughter Deidameia, resulting in a child, Neoptolemus. Odysseus, Ajax the Greater, and Achilles's tutor Phoenix went to retrieve Achilles. According to one story they blew a horn, and Achilles revealed himself by seizing a spear to fight intruders rather than fleeing. According to another, they disguised themselves as merchants bearing trinkets and weaponry, and Achilles was marked out from the other women by admiring the wrong goods. Eventually, a fleet of more than a thousand ships was gathered, commanded by Agamemnon. But when they reached Aulis, the winds ceased. The prophet Calchas stated that the goddess Artemis was punishing Agamemnon for killing a sacred deer (or a deer in a sacred grove) and boasting that he was a better hunter than she. The only way to appease Artemis, he said, was to sacrifice Agamemnon's daughter Iphigenia. According to some versions, he did so, but others claim that he sacrificed a deer in her place, or nothing, and that Iphigenia was taken by Artemis to the Crimea to prepare others for sacrifice to her. Hesiod said she became the goddess Hecate. The Greeks also brought the bones of Pelops, father of Atreus and grandfather of Agamemnon and Menelaus to help them win the war. An oracle said they would be necessary to win. The Greek forces are described in detail in the Catalogue of Ships in the second book of the Iliad. They consist of 28 contingents from mainland Greece, the Peloponnese, the Dodecanese islands, Crete and Ithaca, amassing to a force of some 100,000 men. The Trojan forces are also listed in the second book of the Iliad, consisting of the Trojans themselves, led by Hector, and various allies listed as Dardanians, Zeleians, Adrasteians, Percotians, Pelasgians, Thracians, Ciconian spearmen, Paionian archers, Halizones, Mysians, Phrygians, Maeonians, Miletians and Lycians. When the Greeks left for the war, they accidentally stopped in Mysia, ruled by King Telephus. In the battle, Achilles wounded Telephus, who killed Thersander. The wound would not heal and Telephus asked an oracle who claimed "he that wounded shall heal". Telephus went to Aulis, and either pretended to be a beggar, asking Achilles to help heal his wound, or kidnapped Orestes and held him for ransom, demanding the wound be healed. Achilles refused, claiming to have no medical knowledge. Odysseus reasoned that the spear had inflicted the wound and the spear must be able to heal it. Pieces of the spear were scraped off onto the wound, and Telephus was healed. Philoctetes was Heracles's friend and, because he lit Heracles's funeral pyre when no one else would, he received Heracles's bow and arrows. He sailed with seven ships full of men to the Trojan War, where he was planning on fighting for the Greeks. They stopped on Chryse for supplies, and Philoctetes was bitten by a snake. The wound festered and smelled horrible; Odysseus advised and the Atreidae ordered Philoctetes to stay on Lemnos. Medon took control of Philoctetes's men. Philoctetes stayed alone on Lemnos for ten years. An oracle had prophesied that the first Greek to walk on the land after stepping off a ship in the Trojan War would be the first to die. Protesilaus, leader of the Phylaceans, fulfilled this prophesy. The Greeks buried him as a god and Hermes was sent to show him his wife one last time before going to Hades. His wife, Laodamia, followed him to his death. Alternatively, Hector killed Protesilaus and Laodamia killed herself in grief. After Protesilaus' death, his brother, Podarces, joined the war in his place. The Greeks besieged Troy for nine years. There were occasional skirmishes, both with Troy and her allies. At one point, Greek forces sacked a nearby town and Agamemnon took as his slave-girl Chryseis, daughter of Chryses, a priest of Apollo. When Chryses tried to buy her back, he was rebuked, so he prayed to Apollo to punish the Greeks, and the army was struck by a plague. The events of the Iliad begin at this point. For more information, see that article.COWSAn oracle told Agamemnon he must give up Chryseis. Furious at this, and at Achilles who had guaranteed the oracle his own protection, Agamemnon took Achilles' concubine Briseis as his own. Achilles and Agamemnon argued and Achilles refused to fight any longer. Although the Greeks were destined to win the war, Achilles begged his mother Thetis to intervene with Zeus and ensure that the Greeks did badly until Agamemnon apologized to Achilles. The next day the Greeks were badly beaten in open battle, and all of the major warriors but Ajax were eventually injured too seriously to continue. The Trojans, led by Hector, advanced steadily on the Greek position. Seeing the danger, Achilles let his comrade Patroclus borrow his armour, and lead his troops into battle. Patroclus was killed by Hector who then took Achilles' armour. Maddened with grief, Achilles swore revenge. He donned new armour from Hephaestus brought to him by Thetis, and killed Hector, then dragged his body from his chariot around Troy three times. He refused to return it to the Trojans for funeral rites. Priam, with protection from the gods, personally came and begged to have it back, at which point Achilles relented, and a truce was called for twelve days while Hector was buried. The narrative of the Iliad ends here. During the Trojan War, Xanthus, one of Achilles' horses, was rebuked by Achilles for allowing Patroclus to be killed. Xanthus responded by saying that a god had killed Patroclus and a god would soon kill Achilles too. The Erinyes struck the horse dumb. Shortly after the death of Hector, Achilles defeated Memnon of Ethiopia, Cycnus of Colonae and the Amazonian warrior Penthesilia (with whom Achilles also had an affair in some versions). He was very soon killed by Paris - either by a poisoned arrow (the arrow was guided by Apollo; Paris did not do it by himself), or in an older version by a knife to the back (or heel), while visiting a Trojan princess, Polyxena, during a truce. Both versions conspicuously deny the killer any sort of valour, saying Achilles remains undefeated on the battlefield. His bones were mingled with those of Patroclus, and funeral games were held. Like Ajax, he is represented as living after his death in the island of Leuke at the mouth of the Danube. Achilles' armour/death of AjaxAchilles' armour was the object of a feud between Odysseus and Ajax. They competed for it and Odysseus won. Ajax went mad with grief and vowed to kill his comrades; he started killing cattle (thinking they were Greek soldiers), and then himself. The Greeks captured Helenus, son of King Priam of Troy, a prophet, and tortured him until he told them under what circumstances they could take Troy. Helenus said they would win if they retrieved Heracles' arrows (which were in Philoctetes's possession); steal the Trojan Palladium (they accomplished this with the Trojan Horse; or Odysseus and Diomedes did so one night) and persuade Achilles' son (Neoptolemus) to join the war. Neoptolemus was hiding from the war at Scyros but the Greeks retrieved him. Alternatively, he told them that they could win if Troilius, Helenus' half-brother, son of Apollo and Hecuba, was killed before he turned twenty. Achilles ambushed Troilius. Odysseus and Neoptolemus retrieved Philoctetes from Lemnos. Philoctetes' wound was healed by Machaon or Asclepius. Philoctetes then killed Paris with a poisoned arrow he got from Heracles.DiomedesDiomedes almost killed Aeneas in battle but Aphrodite, Aeneas's mother, saved him. Diomedes wounded Aphrodite and she dropped her son, fleeing to Mount Olympus. Aeneas was then enveloped in a cloud by Apollo, who took him to Pergamos, a sacred spot in Troy. Artemis healed Aeneas there. Later in the war, Diomedes fought with Hector and saw Ares, the war-god, fighting on the Trojans' side. Diomedes called for his soldiers to fall back slowly. Hera, Ares's mother, saw Ares' interference and asked Zeus, Ares's father, for permission to drive Ares away from the battlefield. Hera encouraged Diomedes to attack Ares and he threw his spear at the god. Athena drove the spear into Ares's body and he bellowed in pain and fled to Mount Olympus, forcing the Trojans to fall back. The end of the war came with one final plan. 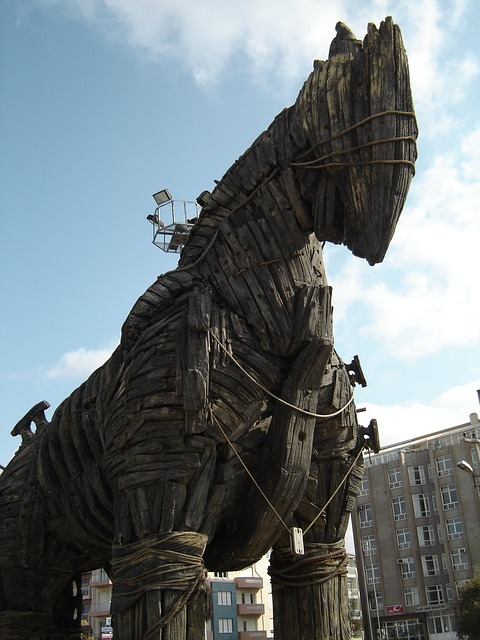 The Greeks (or, in some records, Odysseus on their behalf) devised a new ruse - a giant hollow wooden horse, an animal that was sacred to the Trojans. It was built by Epeius and filled with Greek warriors led by Odysseus. The rest of the Greek army appeared to leave and the Trojans accepted the horse as a peace offering. A Greek spy, Sinon, convinced the Trojans that the horse was a gift despite the warnings of Laocoon and Cassandra. The Trojans, who were understandably overjoyed that the ten-year siege had lifted, entered a night of mad revelry and celebration, and when the Greeks emerged from the horse the city was in a drunken stupor. The Greeks opened the city gates to allow their fellow soldiers in, and the city was utterly destroyed--every single man and boy killed (including infants), every woman and girl enslaved, all its wealth pillaged, and the city itself reduced to rubble. There is much question as to whether a wooden horse was even created. Homer's stories are believed by many to be the merging of many wars fought on Troy. In his merging, he creates many characters out of the gods and uses many metaphors. It is suggested that the Trojan Horse actually represents an earthquake that occurred between the wars that could have weakened Troy's walls and left them open for attack. Structural damage on the city believed to be Troy - its location being the same as that represented in Homer's Iliad and the artifacts found there suggesting it was a place of great trade and power - shows signs that there was indeed an earthquake. Other scholars, including several ancient sources, suggest that the "Trojan horse" was in fact a battering ram. The ghost of Achilles appeared to the survivors of the war, demanding Polyxena, the Trojan princess, be sacrificed before anybody could leave. Neoptolemus did so. According to the Odyssey, Menelaus's fleet was blown by storms to Crete and Egypt where they were unable to sail away because the wind was calm. Menelaus had to catch Proteus, a shape-shifting sea god to find out what sacrifices to which gods he would have to make to guarantee safe passage. Proteus also told Menelaus that he was destined for Elysium (Heaven) after his death. Menelaus returned to Sparta with Helen. According to some stories the Helen who was taken by Paris was a fake, and the real Helen was in Egypt where she was reunited with Menelaus at this point. They had a daughter, Hermione. After the war, Idomeneus' ship hit a horrible storm. Idomeneus promised Poseidon that he would sacrifice the first living thing he saw when he returned home if Poseidon would save his ship and crew. The first living thing was his son, whom Idomeneus duly sacrificed. The gods were angry at his murder of his own son and they sent him in exile to Calabria in Italy. (Aeneid III, 400). In an alternate version, his own subjects on Crete sent him into exile because he brought a plague with him from Troy. He fled to Calabria, and then Colophon, in Asia Minor, where he died. In yet a third version, used by Virgil, the plague was visited upon Crete as punishment for Idomeneus' act. Cassandra was raped by Ajax the lesser, then taken as a concubine by Agamemnon. Agamemnon returned home to Argos. His wife Clytemnestra (Helen's sister) was having an affair with Aegisthus, son of Thyestes, Agamemnon's cousin who had conquered Argos before Agamemnon himself retook it. Possibly out of vengeance for the death of Iphigenia, Clytemnestra plotted with her lover to kill Agamemnon. Cassandra foresaw this murder, and warned Agamemnon, but he disregarded her. He was killed, either at a feast or in his bath according to different versions. Cassandra was also killed. Agamemnon's son Orestes, who had been away, returned and conspired with his sister Elektra to avenge their father. They killed Clytemnestra and Aegisthus. Orestes married Hermione and retook Argos, becoming king over all the Peloponessus. Neoptolemus took Andromache and Helenus as slaves and married Andromache. He feuded with Orestes, because Menalaus had promised his daughter Hermione to him, but now wanted her to marry Neoptolemus. They fought, and Neoptolemus was killed. Helenus then married Andromache and they ruled over a colony of Trojan exiles in what had once been Achilles' kingdom. There Aeneas encountered them on his journey to Italy. Queen Hecuba of Troy was enslaved by the Achaeans. Lycaon was enslaved by Achilles. He was later killed trying to escape. Since Antenor, Priam's brother-in-law, had supported giving Helen back to the Greeks, he was spared. Aeneas led a group of survivors away from the city, including his son Ascanius, his trumpeter Misenus, father Anchises, the healer Iapyx, all the Lares and Penates and Mimas as a guide. His wife Creusa was killed during the sack of the city. They fled Troy with a number of ships, seeking to establish a new homeland elsewhere. They landed in several nearby countries that proved inhospitable and finally were told by a Sibyl that they had to return to the land of their forebears. They first tried Crete, where Dardanus had once settled, but found it ravaged by the same plague that had driven Idomeneus away. They found the colony led by Helenus and Andromache, but declined to remain. After seven years they arrived in Carthage, where Aeneas had an affair with Dido. Eventually the gods ordered him to continue onward (Dido committed suicide), and he and his people arrived at the mouth of the Tiber in Italy. There a Sibyl took him to the underworld and foretold the majesty of Rome, which would be founded by his people. He negotiated a settlement with the local king, Lavinius, and was wed to his daughter, Lavinia. This triggered a war with other local tribes, which culminatied in the founding of the settlement of Alba Longa, ruled by Aeneas and Lavinia's son Silvius. Three hundred years later, according to Roman myth, his descendants Romulus and Remus founded Rome. The details of the journey of Aeneas, his affair with Dido, and his settling in Italy are the subject of the Roman epic poem the Aeneid by Virgil. Odysseus, attempting to travel home, underwent a series of trials, tribulations and setbacks that stretched his journey to ten years' time. These are detailed in Homer's epic poem The Odyssey. 0 Response to "The Legend of Trojan War"